It's been a couple of months since my last Culinary Trends article on eggs was published, and at long last my newest article is out in print so I can finally share it with my readers! It's on the subject of foraging - why it's become popular among many chefs, and some tips for those looking to get started. I was able to speak to some pretty amazing chefs for this one, including expert foragers David Kinch of Manresa and Matthew Accarrino of SPQR. 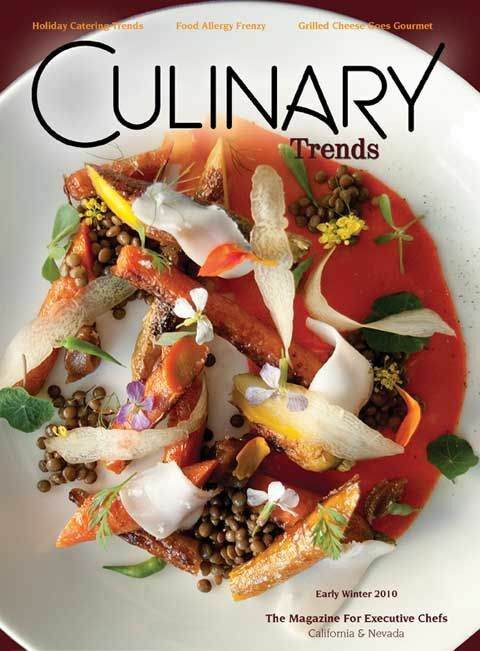 Chef Accarrino's Roasted Carrot Salad dish was actually chosen for the cover (seen above)! 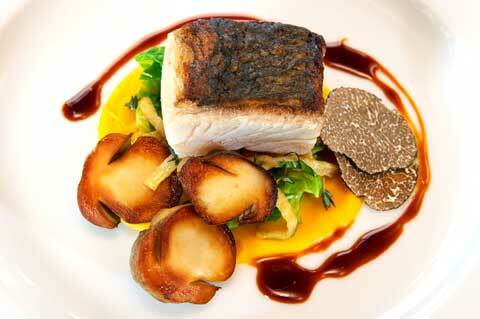 The latest issue and edited version of my article can be found on the Culinary Trends website. Below is the full, unedited version. Enjoy! Let’s start with a timeline: Man is born. Man is hungry. Man begins foraging for his food before inventing basic tools that allow him to hunt and farm. A few thousand years later, man industrializes the system of food production. In the new millennium, man realizes that the old system wasn’t half bad and embraces the locavore movement. Finally in 2010, man takes local sourcing one step further: man returns to foraging. With an increasing number of chefs getting in touch with the ancestral practice of foraging, it seems that our culinary evolution has come full circle. Luckily, returning to square one doesn’t mean serving nuts and berries on a plate - modern developments in cooking have not been lost. Instead, our reconnection to the land and reversion to primitive traditions has, ironically, led to the next stage of contemporary cuisine. By combining this old world approach with progressive techniques that enhance the remarkable qualities of wild ingredients, modern cuisine is being elevated to new heights. Whereas only a few decades ago ingredients were valued for characteristics like how early they could be picked or how long they could stay on the shelf, it’s clear that most chefs are moving away from this outdated attitude. With the profusion of “ingredient-driven” menus, value is now being placed on using the freshest, highest quality ingredients possible – ingredients often found close to home, in the wild. What makes wild ingredients superior to even their responsibly-farmed, biodynamic counterparts? Executive Chef Josiah Slone of Sent Sovi explains it simply, “When you farm something, you have to set all the proper conditions to grow. But when something is wild, the right conditions must naturally exist - you don’t really set anything, it just happens.” Therefore, a foraged ingredient is the purest expression of that particular food – a quality which sets them apart. “Foraged ingredients are unique and interesting, and using them helps differentiate Sent Sovi from other restaurants. Because mulberries are usually too painstaking for most to pick, being one of the only places getting them is a really special thing.” Including a simple mulberry granita on the menu, made solely with mulberries, simple syrup, and vanilla bean, helps Sent Sovi’s menu stand out. As Chef Kinch hints, discovering that one wild ingredient capable of stunning the customer isn’t always a walk in the park, as some may believe. Despite recent attention, the practice of foraging is still shrouded in secrecy, leaving many eager chefs unsure of how to navigate this new culinary terrain. So now the most important question: where to start? Although it may sound easy, foraging isn’t as straightforward as it seems. In the wild, picking out the edible weeds from the real weeds can be challenging. For Matthew Accarrino, Executive Chef of SPQR in San Francisco, it was only after seeing his Italian family forage all of the ingredients for his 26th birthday feast from their land did he realize how much wild vegetation could be used in his cooking. “We’re relatively unaware of all of the stuff around us that’s edible, but food comes from all around.” Now an expert forager, he regularly uses wild ingredients to add a “sense of place” to his Italian-inspired menu. The next step is knowing where to look. Because there are very few chefs or professional foragers willing to divulge their favorite locations, using best practices to explore your area is the best way to find a spot. Chef Accarrino follows a couple of simple rules. “First, I always follow the water source. It makes sense – plants need water to grow so you’ll often find them at the source” Secondly, he always picks high; picking in areas that are difficult for humans or animals to reach helps weed out the potentially contaminated plants. By following these rules, Chef Accarrino now has access to a multitude of wild ingredients, including watercress, spinach, lambsquarter, fennel, prickly pears, sea beans, wild berries, dandelions, chickweed, purslane, stinging nettles, ramps, wild asparagus, flowering mustard, and various kinds of wild sorrel. However, an expedition into the wilderness is not the only way to find what you’re looking for; many chefs opt for less exploratory measures by building relationships with local land owners who can point them to a plant’s exact location. Whatever the method, each can potentially lead to a treasure chest of ingredients. Finally, how are these raw materials transformed into innovative cuisine in the kitchen? By steering away from simplistic “fig-on-a-plate” preparations and approaching these ingredients from different angles, chefs are unearthing progressive applications for foraged items. One method is to find new uses for the overlooked components of plants. As Chef Accarrino explains, “Every part of an edible plant has a purpose. For example, I’ve recently started picking the pods of wild radish, not just the flowers, because they can be pickled and added to salads.” Another new approach seeks to highlight the array of flavors a single ingredient can express through the application of different cooking techniques. At SPQR a simple carrot becomes a show-stopping appetizer by combining slow-roasted carrots, concentrated in flavor, with carrot puree made from the juice of the carrots themselves, tender, herbaceous carrot tops, and thinly-sliced, cold-pickled carrots to emphasize their fresh texture. While getting out into nature to discover incredible ingredients sounds great, there’s one major hitch: with an 80+ hour work week, most chefs simply don’t have the time to start exploring. As Executive Chef Peter McNee of Poggio in Sausalito explains, “Although it’s a lot of fun to play the role of the forager, in your heart, you’re a full-time chef. You can’t be a full-time forager.” Enter the local purveyor. Local suppliers are drawing more attention than ever by bringing superior quality ingredients to chefs who wouldn’t have the time to find them on their own. For example, with 140 seats in the dining room and many mushroom-centric menu options, like pizza topped with foraged puffball mushrooms, Fontina cheese, and mustard greens, Chef McNee would have to forage 80 lbs of wild mushrooms every week. Instead, he turns to a trusted supplier who, along with his team, scours the Oregon and Northern Californian wilderness for all of his fungal needs. Chefs who lack foraging experience and are often uncomfortable with the “trial and error” method of learning are also turning to local purveyors for wild goods. This is especially prevalent when it comes to wild mushrooms, where trying the wrong variety could be potentially deadly. Because of this risk, chefs like Matt Bolten at Pacific’s Edge Restaurant in Carmel work only with trained professionals who are licensed in their field. By working with the same mushroom supplier for over 14 years, he can trust the quality of the confit Porcinis he adds to his preparation of White Sea Bass, served with butternut squash purée, brussels sprout leaves, celery root batons, and a truffle jus. No matter how these ingredients find their way into the kitchen, it’s easy to see why this trend continues to gather support: chefs are using better quality ingredients that add seasonality and originality to their menus; local food communities are being strengthened through the support of local purveyors; and let’s not forget the biggest reward of all: customers are eating better quality food. I love that nature gives the plant a naturally occurring condition. Genius. My body has naturally occurring conditions as a lover of food that are no so genius.